Measure out a tablespoon of paprika, a tablespoon of black peppercorns, a teaspoon of cumin seeds, a tablespoon of salt and about half a teaspoon of cayenne pepper and grind together in a food processor or blender. Add more cayenne if you’re brave. The powder is fiery and full of flavour, and can transform an ordinary piece of meat or fish into something quite superb. 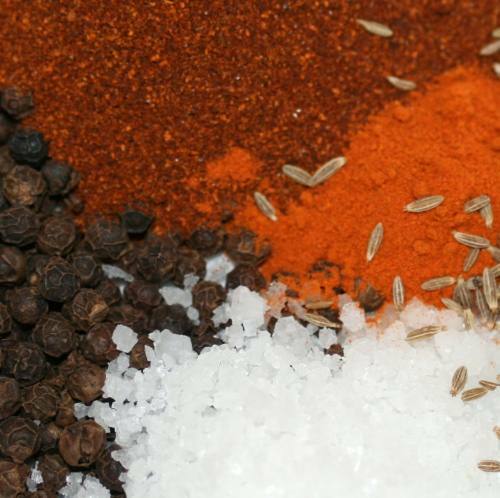 Spice mixes like this are used in Cajun cooking to ‘blacken’ cuts of meat. The meat is coated in spices and cooked, or ‘blackened’ on a red hot griddle. The seasoning cooks to a delicious crust and the meat stays tender underneath. Cajun seasonings are excellent with fish and cuts of dark poultry meat or pork, and work well with most root vegetables. Perfect barbecue flavours. I use this rub often with trout, slashing the sides a few times with a sharp knife and rubbing a couple of teaspoons of cajun seasoning into the flesh. Roasted in the oven, pan fried or grilled, and served with a quick squeeze of lemon and some crusty bread, the results are excellent. It’s worth making double or even triple quantities of this mix. The remains can be kept for a few months in an artight jar in a dark cupboard, ready for midweek evenings and a lack of inspiration.